Here they are - the Topps All-Star Rookie Team, selected "by the Youth of America" following the 1987 season and featured in the 1988 Topps set. I have completed the run of these up through 2018, specifically all regular issue cards that bear the All-Star Rookie Trophy. Do you like homers? Do you like stolen bases? How about Gold Glove defense? Devon Whyte has you covered! The five tool outfielder was born in Kingston Jamaica and came to the U.S. at the age of nine. His family name was misspelled "White" instead of Whyte on the immigration paperwork, and it was not until after his playing days that he had his name legally changed back to the correct spelling. "Devo" was drafted in 1981 by the Angels and worked his way up through their minor league system. He had a couple cups of coffee before playing his first full season in 1987. He hit 24 homers and stole 32 bases, scoring 103 runs. The power output came as a some surprise, he had never hit more than 14 in any minor league season. He won his first of 7 Gold Gloves in 1988. Whyte was 3 time All-Star, and was a World Series Champ in '92, '93, and '97. In Toronto, Devo had a second gear in the playoffs - he hit .336 in the playoffs for Toronto vs .270 in regular season play. He's now a hitting coach at AAA Buffalo for Toronto. Jeff Musselman was on fire in 1987, appearing in 68 games for the Blue Jays as a rookie. He finished 14 games and posted a 12 - 5 record, for an AL leading .706 winning percentage. 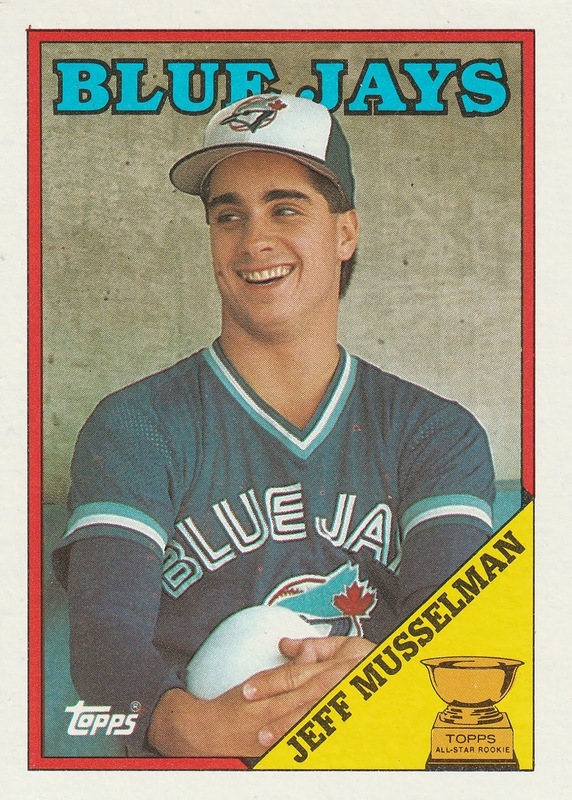 The Blue Jays tried him out as a starter in 1988, and he had mixed success over 15 starts. He had an ERA+ of 123 in 85 innings. He didn't walk many batters, but he didn't strike many out either. The Mets were impressed with the small sample size, and traded Mookie Wilson to get him. The Harvard graduate was used only in relief by the Mets, and pitched his final game in 1990. A Scott Boras client, he joined the agency following his playing career. Ellis Burks was a force of nature in 1996 for the Colorado Rockies, scoring 142 runs, hitting 40 homers, stealing 32 bases, and 128 runs batted in. As a rookie in 1987, the magical Rockies season was just a sparkle in his eye. He did have a very good rookie season, though, hitting 20 homers and stealing 27 bases. He'd rack up 20 or more steals in each of his first three seasons. A shoulder injury in 1989 required surgery and limited his effectiveness. He returned the following season to make his first All-Star team and win his first Gold Glove and his first Silver Slugger award. 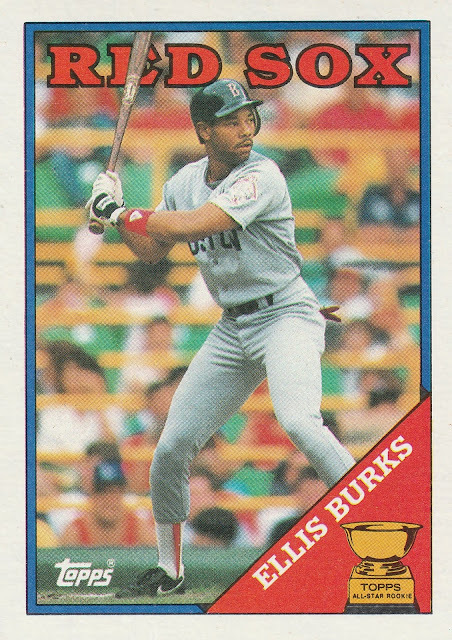 Burks played in 18 major league seasons, but never had the opportunity to play in a World Series. He finished his career with over 2100 hits, 1200 Runs, 1200 RBI and over 350 homers. You'd think that leading the AL in Hits, scoring 105 runs, and batting .323 would be enough to get a Rookie of the Year award, but it turns out that it was not quite enough in a crazy talented rookie class. He did make his first All Star Squad, and was even garnered some MVP consideration. Seitzer had the thankless task of taking over for George Brett at third base, who was moving to first base to save some wear and tear. 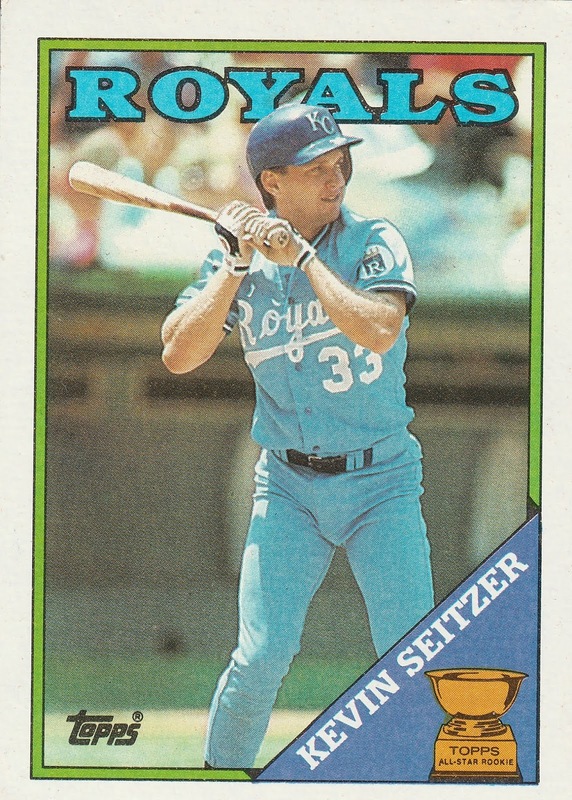 Seitzer was not exactly a Gold Glover over there, leading the AL in errors committed in 87 and 88. He worked hard on his defense, however, and by 1992 he turned it around and led the AL in fielding pct among third basemen. Seitzer became a free agent on his 30th birthday after being released by the Royals. The team had acquired 3B Gregg Jeffries in the off-season from the Mets for Bret Saberhagen, and apparently Seitzer had developed a reputation for a poor temper and had a chip on his shoulder after being benched for his poor defense. His 1992 season was salvaged when the Brewers came calling and installed him as their everyday Third Baseman. He became a free agent the following off-season and signed with the Oakland A's. He slumped a bit, hitting only .255 in the first half of the season. He made his only career pitching appearance with Oakland, recording the final out of a 10 - 2 rout by striking out Carlos Martinez. The limited production was not in Oakland's plans, so they released Seitzer, only to be picked up by the Brewers again mid season. He would have several productive seasons there, including his 2nd All-Star appearance in 1995. He was traded during Cleveland's stretch run in 1996 in exchange for Jeromy Burnitz, and played the 1997 season as a utility man / pinch hitter. 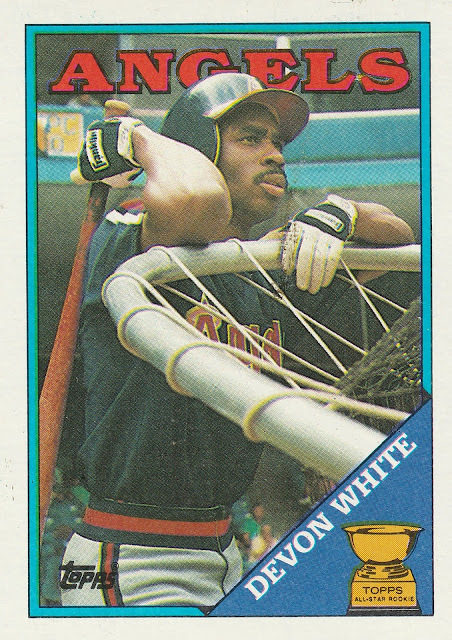 He played in his first World Series with Cleveland, losing out to fellow Topps All-Star Rookie Devon Whyte's Florida Marlins. Al Pedrique is a baseball lifer - he spent 10 seasons in the Mets minor league system before making his debut in 1987. The Mets traded him to the Pirates after 5 games, and he was used all over the infield for Pittsburgh in 1987. He hit .301 over 88 games. He smashed his only career homer for the Pirates - a three run blast against the Giants in Candlestick Park. His playing career was over after a handful of games in Detroit the following season. 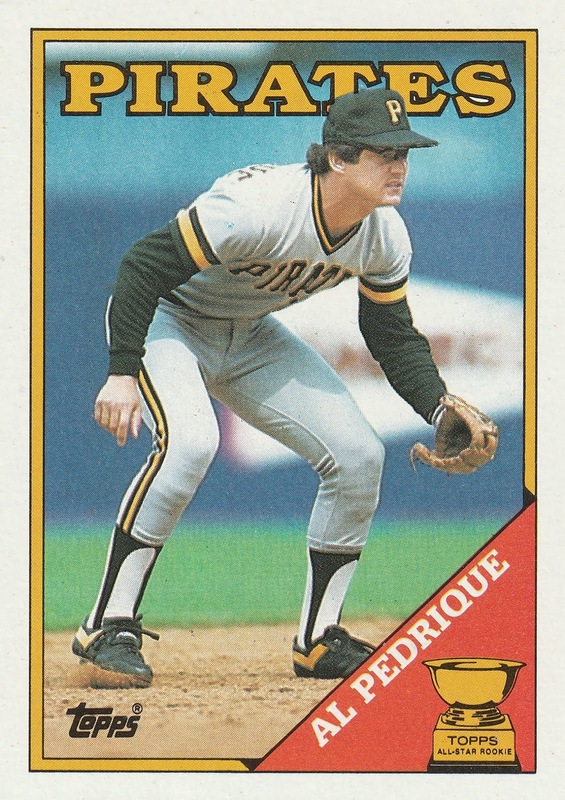 Pedrique has coached for the Oakland A's, the Astros, the Royals, and the Diamonbacks. He was the interim Manager for the DBacks in 2004, taking over for Bob Brenly. Pedrique sang the praises of then 16 year old Jose Altuve while coaching in Venezuela to his team at the time, the Houston Astros. In recent years, he served as Manager in the Yankees' minor league system winning the International League title in 2016. He was on the Oakland A's Major League coaching staff in 2018. 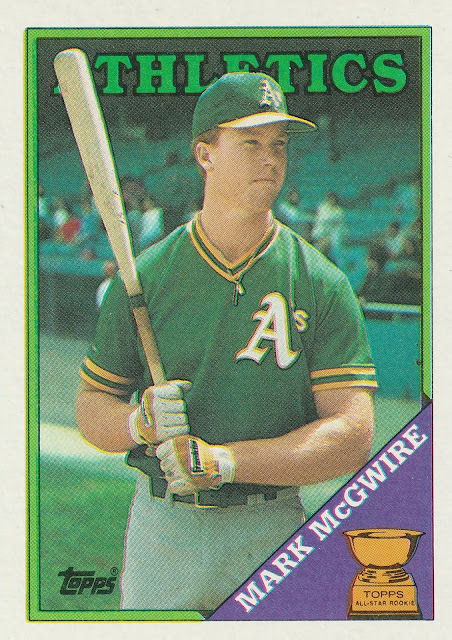 Big Mac was already a known quantity as member of the 1984 Silver Medal Olympic baseball team when he was the #10 Overall Draft Pick by the A's. He made a steady rise through the Oakland farm system. 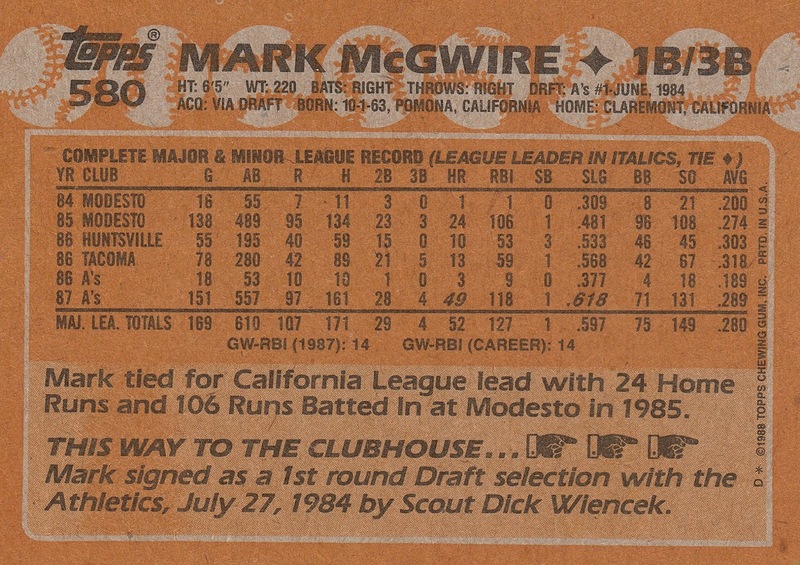 By the All-Star break in his rookie season, McGwire had already clubbed 33 homers, forming the other half of 'The Bash Brothers' with Jose Canseco. He would go on to set a record with 49 homers in his rookie season, which also led the AL. He was the AL Rookie of the Year, and also led the AL in slugging percentage. When healthy, McGwire displayed prodigious power. 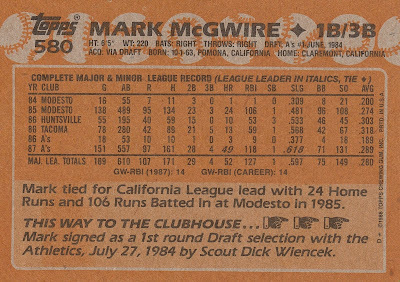 In fact, using the relatively new stat of DRC+, McGwire was an elite power hitter, in the same class as Ruth, Gehrig, and Ted Williams. Whoa, whoa, whoa! I'm not saying he was as good of an overall hitter as those guys, this stat is really just evaluating the damage that a hitter creates - it's pure power over batting average or situational hitting. Baseball Prospectus' Zach Crizer breaks it all down in this article. McGwire famously set the single season home run record in 1998, in an historic chase with Chicago's Sammy Sosa. The country was willing to forget about the 1994 Strike, though it ultimately traded one controversy (labor relations) for another (Steroids). The 12 time All-Star and 1989 World Series Champ retired with 583 career homers. He led the league in homers 4 times, OBP twice, slugging 4 times, and OPS+ 4 times. His legacy was tarnished by steroid allegations and his appearance before congress stating that he "did not come to talk about the past" when given the opportunity to deny using steroids during his playing career. Though he leaves behind a complicated history, he remains one of the most prolific power hitters of all time. There have been countless examples of father/son combos in Major League baseball - the Griffeys, the Boone dynasty, the Bonds family, and on and on. But Casey Candaele is (so far) part of the only mother/son combos in professional baseball history. Both Casey's Mother and Aunt played in the AAGBL, the all female Professional Baseball League seen in the film A League of Their Own. Candaele made a name for himself as a slick fielding, switch hitting middle infielder. He was a member of the 1980 Arizona Wilcats National Championship team, and was signed as an amateur free agent by the Expos in 1982. In his rookie season, he played all three outfield positions, as well as second, short, and first base. His best MLB seasons came in Houston from 1990 to 1993. He was on the 1997 Cleveland team that made the World Series, though he did not play in the Fall Classic. Much like Robby Thompson on 1986's All-Star Rookie Class, Mike Greenwell was never his team's biggest star, but by spending his entire career in one place, he was a beloved fan favorite. Over 12 seasons, Greenwell had 1400 hits and 2 All-Star appearances. His sophomore season in 1988 was his best - he finished 2nd in the AL MVP vote that year, hitting .325 with 22 homers and 119 RBI. 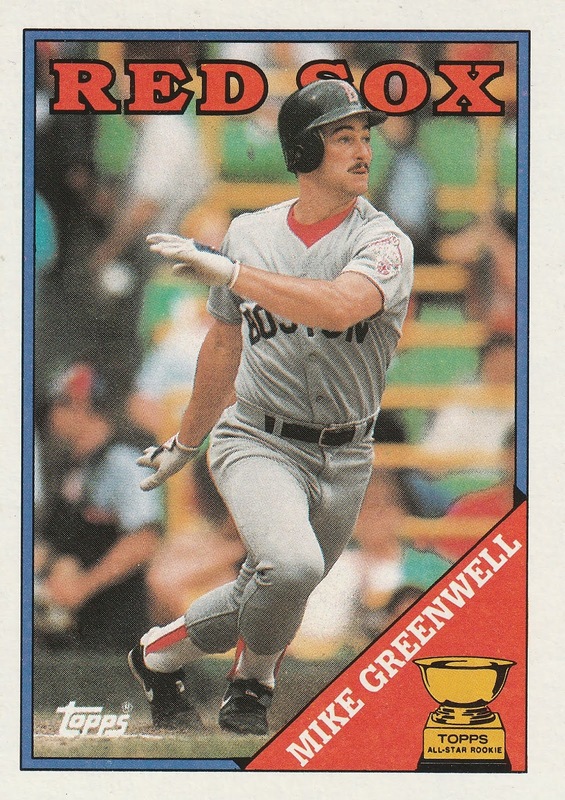 As a rookie in 1987, Greenwell hit .328 with 19 homers and 80 RBI. Playing in front of the Green Monster in Fenway, he led the league in outfield assists three times, though he was rarely described as a particularly talented fielder (especially with Gold Glover Ellis Burks playing next to him). Greenwell also played briefly in Japan following his Red Sox tenure. Mike Dunne has similarities with several other All-Star Rookies. Mike Dunne was also a member of the 1984 Olympic Baseball team, like Mark McGwire. He attended Bradley University just like Kirby Puckett, who was on the 1984 All-Star Rookie Roster. Like Jeff Musselman, he led his league in Winning pct his rookie year, going 13 - 6 for the Pirates. 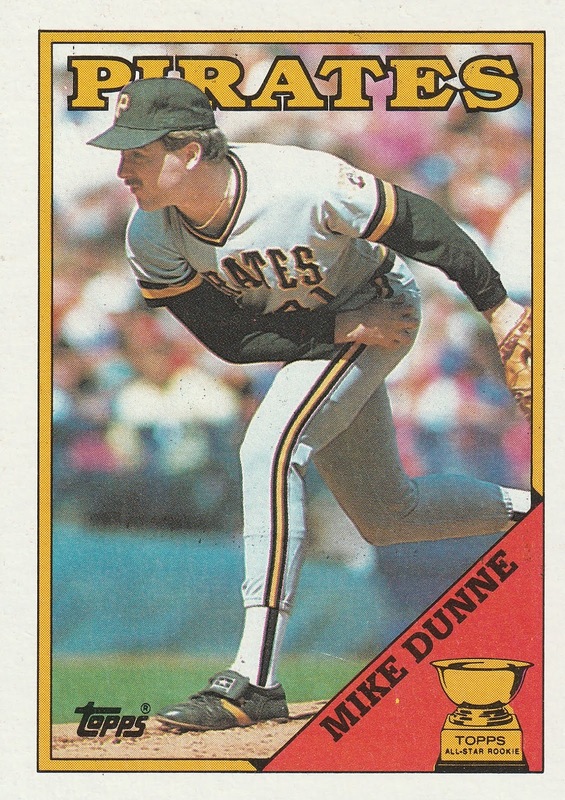 Dunne was part of the Andy Van Slyke trade, and like Al Pedrique had his best season as a rookie. He cruised through the National League in 87, posting an ERA+ of 135 and finished 2nd in ROY balloting behind Benito Santiago. 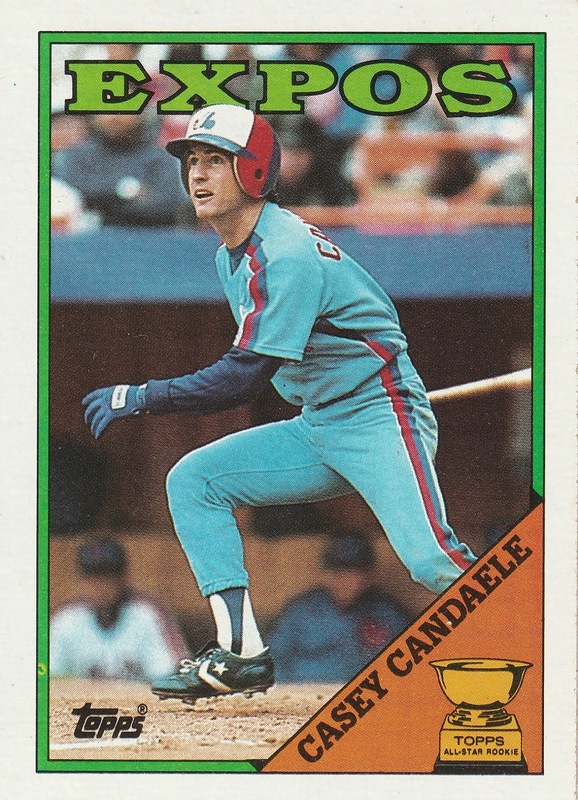 He was traded to the Mariners in 1989, and injuries derailed the balance of his major league career. He later returned to Bradley U, where he serves as the team's Pitching Coach. San Francisco (N.L.) 1985, Detroit (A.L.) 1986 -'90, New York (A.L.) 1990 - '94, Baltimore (A.L.) 1995, Colorado (N.L.) 1995. Nokes had an all-time great season for a catcher in 1987. To beat out NL Rookie of the Year Benito Santiago to make the All-Star Rookie squad, he'd have to. In 1987, Nokes made the AL All-Star squad and crushed 32 homers and drove in 87 while hitting .289. He won a Silver Slugger at Catcher, quite the rare feat for a Rookie. While he was unable to repeat that level of home run power again, he did have a few good seasons in New York, including 24 homers in 1991. 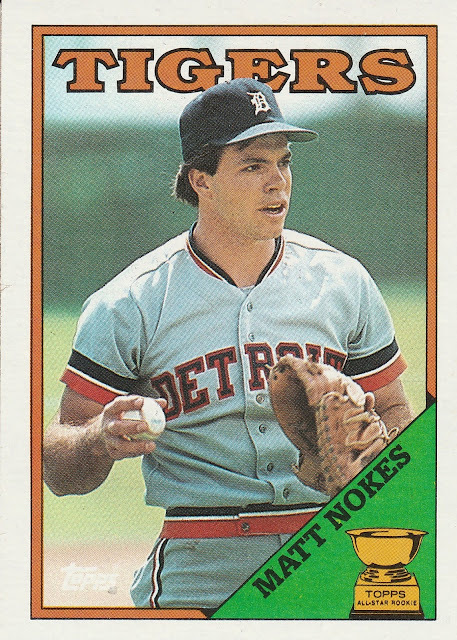 Nokes was the catcher for Jim Abbott's no-hitter in 1993. One of the best-looking rookie cup sets of all-time.